Jan 2011 -- We've taken the directory down since most of the links are broken. If you're trying to find fic or contact us, try the Backstreet Bauhaus LiveJournal community, bsbbauhaus. Bauhaus Classics is still up. The Classics archive finds and preserves Backstreet Boys fanfiction that would otherwise be lost. 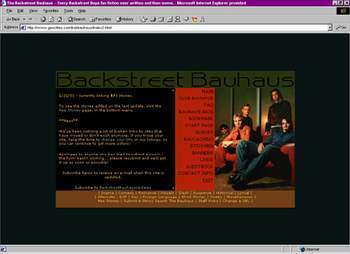 The Backstreet Bauhaus was formed by Apassionada Cunningham in May of 2001, as the largest archive of Backstreet Boys fan fiction on the web. The aim of the Backstreet Bauhaus was to bring together the greatest Backstreet fan fiction writers from all over the world to create one of the most powerful and influential literary sites on the Web. Bauhaus is pronounced "bow-house". The Bauhaus was a German house of teaching in the art of architecture and craftsmanship from 1919 to 1933, before Adolf Hitler closed it, believing it to be a conduit of Communism. The Bauhaus' founder was Walter Gropius, and the "House of Building" is famous for its architects of the International Style. Many popular designs of furniture and buildings come from the Bauhaus, and are in effect still used today. Here within the Backstreet Boys community, the Bauhaus was a link archive of any and all fan fiction that feature Nick, Kevin, Brian, Howie or AJ. In addition to this link library, the Bauhaus promoted fan fiction and writing. In the past, this site featured reviews of fan fiction, writing contests, fan fiction and writing discussion, and a fan fiction awards competition. Here are some of the site layouts the Backstreet Bauhaus has had over the years.